Find out what our experts have to say about Honda Hornet 160 R! The CB Hornet 160 is Honda’s third attempt in the premium 150cc segment and it seems the Japanese bikemaker has gotten it correct this time around. The sharp and edgy styling has appealed to the youngsters while the Honda name brings endows it with reliability. The CB Hornet 160 is a good option for someone in the hunt for a sporty, comfortable and easy to ride 150cc machine. The least priced variant is Honda CB Hornet 160R priced at Rs. 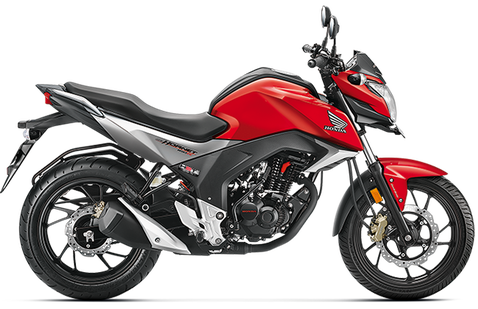 1,01,038 and the most priced variant is Honda CB Hornet 160R ABS DLX priced at Rs. 1,10,323. Choose the Honda Hornet 160 R which fits the bill of you. In India, Honda Motorcycle & Scooter India (HMSI) is known for its supreme reliability, fuel efficient motorcycle technology and amazing build quality of commuter bikes and scooters. Honda Activa is the highest selling scooter as well as the highest selling 2-wheeler in India, while the sales of CB shine is eating away the bike market share of Hero MotoCorp. With two wheelers like these and also including CB Unicorn, Dream, Dio; HMSI is the 2nd largest 2-wheeler manufacturer in terms of sales in India. They are growing at such a rapid pace, that has made Hero MotoCorp to pull up their socks and get to work developing new products for the Indian bike Market. Other manufacturers knew this well and moved on to greener pastures where Hero as well as Honda were not paying much attention. This was the chunk of riders who needed a sharp, sporty looking bike that they can enjoy during the weekends, but also use it as a commuter bike during the weekdays. So in came the Yamaha FZ, TVS Apache RTR 160, Suzuki Gixxer and the latest Bajaj Pulsar NS160. With increase in demand for these bikes, Honda took notice and tried creating their own avatar. After some unsuccessful attempts with the CB Trigger and the CB Unicorn Dazzler, HMSI finally launched the CB Hornet 160R. This bike took the two wheeler market by storm. CB Hornet 160R stands way ahead of its competition by catering to generation that wants something stylish, powerful, yet fuel efficient for daily use. With features such as single channel ABS, muscular tank, snazzy graphics and a wide rear tyre, demand is surely increasing for this aggressive looking bike. Available in four variants - STD priced at Rs.85643, CBS priced at Rs.90143, ABS STD priced at Rs.91143 and ABS DLX priced at Rs.93643 (all prices, ex-showroom, Delhi), this bike is sure to grab eyeballs as it zooms by. When you cast a gaze at the new CB Hornet 160R, the thing that will attract you the most is its new headlamp. It is a sharp looking split LED headlamp with the Hornet branding in the middle. With subtle changes to the font and the design, the new body graphics looks very bold and sporty. CB Hornet 160R now comes with an attractive Dazzle Yellow Metallic colour including the Mars Orange, Sports Red, Striking Green, and Athletic Blue Metallic. Digital instrument console almost remains the same with speedometer, tachometer, odometer, trip meter, fuel gauge and a clock displayed on it. Only the color of the backlit has been changed from amber to blue, and it does miss out on the gear position indicator which is available on the Honda XBlade. Seat is on the stiffer side as compared to the XBlade, which has a long and plush one. Alloy wheels on this bike are one of a kind with the multi spoke pattern and sporty rim stripes which makes it really attractive. X-shaped tail light is still the same and is one of the best looking in the entire segment. The overall silhouette of the bike is very chiseled, muscular and sporty that makes it a head-turner for sure. The first generation Hornet was more power personified as compared to the Gixxer or the FZ and was one of the most powerful bikes in its segment. Compared to that Hornet, the power on current generation bike has been toned down to provide more fuel efficiency. Powering the new CB Hornet 160R is same air Cooled, 4 Stroke, SI, BSIV compliant engine that now churns out a low 14.9bhp of max power at 8500rpm (instead of the 15.5bhp of max power that the first generation Hornet offered) and a peak torque of 14.5Nm at 6500rpm. This engine has been built with the Honda Eco Technology (HET) system and is mated to smooth 5-speed gearbox. Previous generation model lacked the thrill and the excitement that the first gen had on offer. But now with the latest model, though the power figures remain unchanged, the bike is tuned in such a way that it feels a lot peppier with a punchier power delivery. With a fuel tank capacity of 12 litres, it gives a mileage of around 45kmpl and a top speed of 115kmph. Despite its muscular and brawny looks, the new CB Hornet 160R feels very nimble and light to maneuver that city traffic. With an ultra smooth gearbox and a featherlight clutch, the riding pleasure of this bike is further enhanced. Compared to last gen model, the throttle response is quick and offers a much better ride quality with the telescopic suspension up front coupled with the monoshock at the rear. Stiffer suspension are a thing of the past, as the current CB Hornet 160R is tuned to be more comfortable and supports well at higher speeds too. Braking on this bike is much better now as it comes with a single channel ABS as optional. Petal Disc of 276 mm on the front and an option of a drum brake of 130 mm or a petal disc of 220 mm on the rear provide enough bite and feel to the rider. Tyres remain the same with 100/80 section tyres on the front while a 140/70 section at the rear. Single channel ABS is best safety feature included as it not only provides stability while braking but also keeps the rider safe by not letting the bike slip. Other safety attribute is the mandatory AHO feature that makes the bike visible in any light or weather conditions. Also the fat rear tyre provides enough grip for any road conditions that you might have to tackle on your way. Now the bike is also equipped with hazard light switch which turns on all the turn-indicator lights to offer better visibility to oncoming traffic during rainy or foggy conditions.